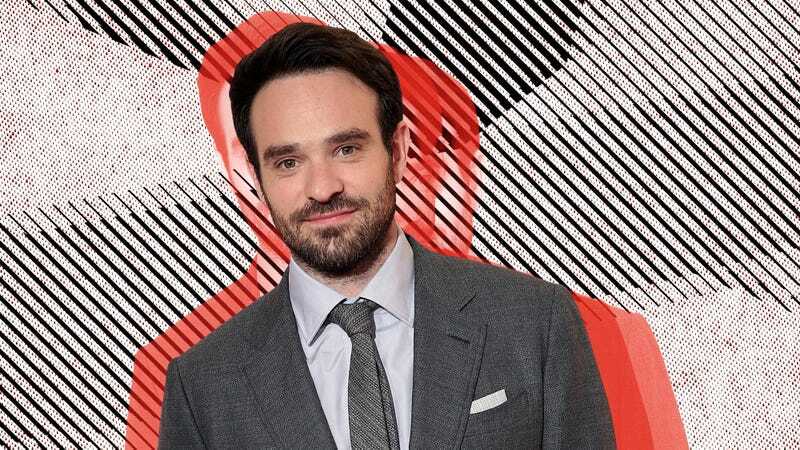 After beginning his career in the theater, British actor Charlie Cox has spent the better part of two decades delivering smart, understated performances on film and television. Although he first came to attention for his naif-ish starring role in Matthew Vaughn’s Stardust, the actor soon found greater fame in the worlds of crime and violence—first on Boardwalk Empire, then for three seasons in the title role of the Marvel Netflix series Daredevil. The A.V. Club spoke to Cox on the eve of the release of King Of Thieves, a new crime drama (based on an infamous real-life robbery) that finds the 36-year-old actor teaming up with a who’s who of British gangster-pic legends: Michael Caine, Jim Broadbent, Tom Courtenay, Ray Winstone, and Michael Gambon. We spoke to Cox about the wild opportunity of starring in a film with such luminaries, the way his career has come to find a sweet spot amid all that underworld violence, and the unexpected end of Daredevil. CC: It was nuts. You know, literally Friday—I got the call on a Friday, and on Monday night I was on a plane. AVC: Once you got there, what was it like in between takes? I have to imagine there was an element of wish fulfillment on that shoot, getting to hang out with all those guys at the same time. CC: It was fantastic. And one of the reasons it was fantastic is because normally when you’re doing a movie, in between takes, sometimes the setups are quite long. You get half an hour, sometimes an hour, and most of the time, people end up going back to their rooms or their trailers and just relaxing. But because—with all due respect to these guys—because all of them are in their 70s, it was almost too far. So they ended up setting up chairs for everyone just literally on set, right where we were filming. And of course if they’re all sitting there, I’m not going back to my trailer! I’m sitting with them. So there were long days where we’d all be shooting and just sitting around chatting, and I’d get to listen to all their great stories from the ’60s and ’70s. It was the stuff of dreams, really. It doesn’t get much better than that. I heard some fantastic anecdotes. AVC: Actors will often talk about how they continue to learn new things throughout their career, but this must have seemed like a genuine opportunity to watch some of the greats. Are there things that you feel you learned on this film, or specific moments you remember when looking back on this one? CC: I feel like that’s true of anything, if I’m honest. I feel like I’ve done a scene or an episode of television with a 19-year-old kid who is doing his first job, and I’ve come away from that thinking, “Wow, I’ve learned a lot from that guy.” But obviously, with the likes of Caine and Gambon and Courtenay, and, you know, one of my heroes is Jim Broadbent just because of his range. For me, it seems unlimited. And so I’m always very interested when you work with people who have had such success for such a long time, for so much of their career. I’m always interested to see particularly what their process is like. Are they off doing some very bizarre ritual before each take? Or are they sitting there, smoking a cigarette and drinking coffee? I’m always interested in that kind of stuff. These guys all seemed very, very down to earth, as normal as can be between takes and [then] they pull out the big guns. But to answer your question, here’s what was encouraging to me: These guys have been at the top of their game for decades. And what is very encouraging to me is what I believe is important as an actor is that they were never late. They were always nothing but polite and kind to everyone on the set. And they allowed the director—who, obviously, James is a fabulous director, but he’s been doing it for less time than they have, some of them—they allowed the director to run the ship, you know? And that’s the vital end. So that for me was very encouraging. AVC: You’ve played a number of criminals over the years, but this was a chance for you to play this really timid, unassuming guy, which is not exactly what you’re known for. Did it feel like a chance to play against type? CC: The funny thing was a lot of that was discovered in rehearsals. Basil [Cox’s character —Ed.] is the one character we don’t know much about. And this was a conversation I had with James and also Joe Penhall, who wrote the script—was that we had a little bit more license for discovering who Basil was in the rehearsal period. The thing for me that I kept on going back to is you’ve got these two problems with Basil that don’t quite add up. How do you explain, on the one hand, that he’s one of the best alarm specialists, one of the best computer geniuses in London at the time? But then how do you then also explain that if he’s the one with the key, and he got into—in the building, as it were, he was the catalyst—then why isn’t he doing it with younger criminals? Why hasn’t he got any mates of his own that are a bit more physically capable of a smash-and-grab-type robbery? So the thing that we arrived at was this idea that he’s kind of brilliant, kind of a recluse, and he’s maybe slightly on the spectrum or doesn’t quite have the social skills and doesn’t really have any mates. And so he ends up hanging out with Brian Reader a lot, who’s recently lost his wife and is himself quite lonely. From that came this quite timid, quite socially awkward thief. AVC: It’s remarkable the extent that certain thematic arcs seem to have played a role in shaping your career—specifically worlds of crime and violence and the cost of living in those worlds. Was there a moment for you when you realized these were roles you were connecting with? CC: Can you give me examples? I do want to make sure we’re on the same page. AVC: When you were doing Boardwalk Empire, you played this roguish ladies’ man who has a sense of faith in himself even while killing people. From there to Daredevil to other roles like this, you seem to have found a particular talent for inhabiting people who are trying to walk between dark and violent worlds of crime and the everyday. CC: For the longest time, that wasn’t the case. For the longest time, people associated me more with the Stardust and the bright-eyed, bushy-tailed, “earnest young kid trying to do the right thing” kind of thing. And so Boardwalk Empire kicked it all off. Boardwalk Empire was an opportunity for me to explore a very different side to myself from an acting standpoint. And I really enjoyed playing someone who keeps his cards quite close to his chest. Whereas every character I played up until that kind of reveals everything to the world, whereas Owen Sleater, you just always felt like he was playing a much larger game than he was letting on. It was from Boardwalk that I got Daredevil. The execs at Marvel had seen that and thought that I was right, and they got me in the room for Daredevil. I guess what I’m saying is if that’s what I’m becoming known for, which I think is totally legitimate, it almost happened through a bit of luck and a couple of jobs that captured the imagination of the public a little bit. The truth is, given the opportunity to play someone whose morality is in any way questionable, or the lines at least are blurring between right and wrong, I’m always interested in finding the human element in that human being. Those people also must fall in love. They also must fear being found out and fear consequences. Otherwise, they’re not interesting to watch. If you’ve got someone who is completely unafraid of everything and everyone, then over a period of time, people in television, I don’t think that’s very interesting to watch. You’ve got to find someone who somewhere, deep down, has got a lot to lose. And I think that, in the end, makes these people slightly more three-dimensional. CC: I honestly don’t know that answer to that. The other night, I rewatched, probably for the fourth or fifth time, The Departed. I thought, “I’ll put in 20 minutes before I go to bed.” And I ended up watching the whole thing again. A film like that, the kind that exist in the criminal underground. Is there a part of me that loves the idea and subconsciously is wondering what I would be like if my life had turned out differently and I was thrust into that world? Or is it just great drama? Is it just great storytelling? Is it as simple as that when you’re involved in criminal activity? The stakes are high. The stakes become very high because we’re dealing with life and death if it’s violent criminals, but even if it’s just consequences of lifetime imprisonment. That’s a big consequence, you know? So I honestly don’t know. I do think that as audience members, we respond better to people who have struggles, particularly character morality struggles. I think that as audiences, we don’t think of ourselves as completely, thoroughly innately good. We think of ourselves as people who try to do the right thing, but also don’t always get it right. I think we identify with people who struggle with that. I think that’s why Daredevil has worked as a character in the TV show that we did, because he’s ultimately a force for good that doesn’t always get it right and ends up making bad decisions and hurting people that he loves. AVC: With season three, it seemed like you guys had found your stride creatively. Do you see Matt Murdock as somebody who still believes in himself? Do you think at that point he still saw himself as trying to do the right thing? Or was he having a crisis of conscience at that point? CC: In all honesty, doing a long-running television show, this is kind of the first one for me. Because although I was on Boardwalk Empire, my character—there’s so many characters on that show, I only had a couple of scenes an episode, if that. So one of the things when you start to read the new season is, you start to think, how do we make this the same but different? How has what has happened to this character in the past impacted him, and therefore, how has it changed who he is, if at all? But I do think if you’re making a TV show that runs for 13 hours every season, you have to be on a journey of growth, or even if you regress a little bit, you’ve got to be changed. You’ve got to be affected by the things that happened to you, especially in that kind of world. So with this season, it was obviously very clear from the outset that he was kind of damaged, psychologically and physically. The thing that became interesting to me, that I discussed with Erik [Oleson, executive producer] early on is, what if, based on everything that’s happened, he starts to believe that maybe he is actually the bad guy? Maybe all along he’s been wrong and has to consider the fact that he’s actually been harmful to the society in which he lives. Can we tell a story about a man who believes he might be waking up from a delusion? Like a serial killer who has believed he’s doing good? It was just because I wanted to do something a bit different, and partly because I think the writing was there, and Erik has pitched such a great season that I thought it was appropriate and fun. AVC: Is there a particular memory you have from shooting that last season that really sticks with you? CC: The moment I’ll never forget is the prison fight from that season from episode four. That was such a cool couple of days. When I read it, I remember thinking, “Oh, we can’t do this. It’s not possible. No way.” I felt like the writers had got overexcited and that they’ll have discussions with the department heads and everyone will realize that it’s not feasible. And I couldn’t believe it when they told us that we were going to do it, and we started learning the choreography. And then also knowing that I would be doing a huge portion of it, 80-something percent, probably. It was exciting to me, but also nerve-wracking. From a larger point of view, that scene will always stick in my memory. But from a character’s point of view, I don’t know. I think maybe in the third season where he essentially, for a moment, kind of tries to commit suicide by... suicide by thug. For a Catholic, that’s a huge deal. CC: I would still have even more story to tell. I’m kind of more in the dark about if that’s in any way possible for anyone else, if that show will have a future. I’m sure it will probably take a while to let go of a character that you’ve played for a long time. I still feel like I am that character right now. I don’t know. I guess it is what it is. It’s the uncertainty that kills you. [Laughs.] In a way, I think I just put that in the back of my mind, and I’m focused on other work right now, and we’ll see what happens, and if it’s meant to be, it’s meant to be. AVC: So if Disney called tomorrow and said, “We need Daredevil to team up with Hawkeye,” you’d be on board. CC: [Laughs.] Yeah, where do I sign?